Realistically, I must say there's nothing like getting to spend a Saturday meandering around a town of fond memory. These days, weekends are so full of wedding planning, driving, and other tasks that the luxury of window shopping and taking in a nice lunch in an old haunt feels like a sweet chunk of heaven. I couldn't have picked a better spot to unwind recently then Lambertville and New Hope. Though neither really hold much history for me (I've only been there about two hands worth of fingers), I have had a lot of good family and friend time there as well as in nearby Washington's Crossing Park (ps: the PA side is better). Back to the day of unwinding, it was an early Thursday afternoon as a pal of mine and I were making our way through lovely Lambertville after just finishing lunch. We had dined at local Caffe Galleria which was mighty scrumptious though a bit small portion-wise (I'm much more a quantity vs quality guy when it comes to meals). After lunch naturally comes coffee but I sadly knew of zero good places in the area. Once again, internet to the rescue as when I was doing my homework on the area, I had found that there was a local shop that roasted their own called Rojo's Roastery. We walked all the way north deep into the narrow one way streets and random little shops. Finally, just when the street was about to end we found the place tucked into what appeared to be an office building. The exterior held a very professional crispness with some nice creative elements, but it came across very sterile (like a hospital) probably because of the color choices. The interior on the other hand opened into a vibrant, beautifully transformed loft-esque space with a really nice service counter to the right, some really chic tables and decor, and the drum roaster/beans/all supplies organized to the left. Though to the studious eye it had a lot of stuff going on, it was tremendously well orchestrated. Since I had never heard of this place I was truly expecting crappy coffee. Imagine my surprise when not only was it good, it was extravagant! Upon further inspection of the coffeehouse, they really seem to know what they're doing, with their coffee offerings, the right language, etc. The espresso also knocked my proverbial socks off. The barista knew well and good what she had to do to pull a good doubleshot. The espresso tasted a little blunt at first, but then came across with a real sweetness and a beautiful finish. 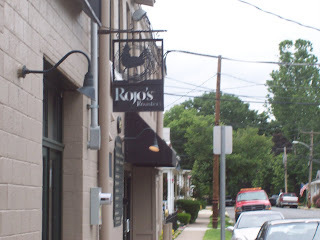 Rojo's really managed to make that day of Lambertville meandering that much better for me. I must say that though the entire expanse of Lambertville and New Hope may be devoid of any good coffee or espresso, you can definitely find a nice java repose at Rojo's. It's worth the walk or drive, believe me. My visit yesterday to their Princeton location prompted a look back at this vague post from 2007(!) which was in dire needs to updating. Rojo's now has three locations (Lambertville, Princeton and Hopewell) and has been continually rocking the socks of their patrons. In the past years, I have had countless great experiences with their well-selected and expertly-roasted coffee, including a top notch espresso program that has consistently managed to impress. I love the Cup of Excellence offerings and the scones. Just wanted to let everyone know that Rojo's will start using a Clover in the very near future!